Just grab your mouse and start building! This amazing 3D design studio lets you create practically any type of structure or outdoor environment with electronic building blocks that click into place. 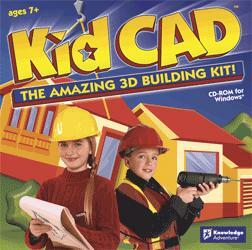 And with Kid CAD™, building is only the beginning. You can paint and decorate everything in sight, including the kitchen sink. Then fill your customized creation with a huge assortment of people and pets, furniture and ferns—or even a dinosaur. Start with a single block or an entire pre-fab house. Design & furnish your creation using dozens of colors, patterns, & materials. Zoom in & out, switch to a bird's-eye view, or circle around to see your creation from a different angle. Where would you like to live? The big city, a small town, or a countryfarm...the choice is yours. Liven things up! Choose from a zany assortmentof people, animals and plants. Sensational sound effects make building asfun as it sounds! No hard hat required! Just grab your mouse and start building! This amazing 3D design studio letsyou create practically any type of structure or outdoor environment withelectronic building blocks that click into place. And with Kid CAD, building isonly the beginning. You can paint and decorate everything in sight, includingthe kitchen sink. Then fill your customized creation with a huge assortment ofpeople and pets, furniture and ferns or even a dinosaur.